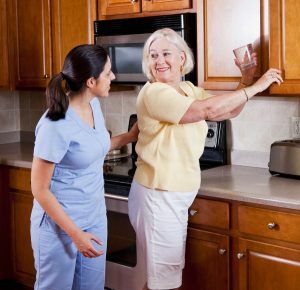 Our Licensed Occupational Therapists will assess your current level of function to create an individualized therapy plan designed to develop, recover or restore maximum independence in all aspects of daily living to safely discharge home. Occupational Therapy interventions focus on adapting the environment, modifying the task, teaching the skill, and educating the patient / family in order to increase performance of daily activities. Patients prepare to successfully transition home by learning skills in our full service kitchen located within our State of the Art Rehabilitative Gymnasium. At Meadowbrook Healthcare, our therapists play an important role in facilitating early mobilization, restoring function and preventing further decline through the use of skilled techniques.